Without context — or at least an explanation of the acronym — you might think flyweight Andrea Lee has been punched in the head one too many times. But that’s not the case. The 26-year-old Texas native is a determined fighter who wants nothing more than to achieve greatness in combat sports. Lee’s start in martial arts came while she was working as a waitress in a sports bar. It’s a far cry from where she is today. “I didn’t expect to go this far,” explained Lee. “At first, I just wanted to do it as a hobby and learn to defend myself. “But I learned to fight. And that was something I wanted to do as a kid. I started competing and fell in love with it. [Now] I want to be remembered as the greatest of all time. Keep going, she has. Lee was a natural in both the ring and the cage. With only a few years of training, she captured two Louisiana Golden Gloves titles. In 2013, she claimed the National Golden Gloves championship. However, her success in the boxing ring wasn’t enough to keep her away from MMA. “We were thinking of going to the Olympics, which is why I was mainly focused on boxing at first, but we decided that MMA was our best route,” declared the fighter. “Women’s MMA was taking off and boxing was kind of dying. Despite a preference for the cage, Lee continued to develop her skills while competing in boxing, Muay Thai and kickboxing. Along the way, she married her coach, Donny Aaron. The pair’s relationship created an interesting dynamic to her training. “Donny… he pushed me. It’s probably the toughest part of training. It’s more personal. When he’s getting on me about something or going harder on me than anybody else, sometimes he gets under my skin. I get angry ’cause he’s yelling at me to do something; I get frustrated,” revealed Lee candidly. The relentless coaching from Aaron, a former kickboxer, has turned Lee from a novice into a decorated combatant in every aspect of combat sports. And although the pair’s coach-student relationship is a huge part of their day-to-day life, they do their best to focus on something more important: their daughter, Ainslee. “It’s amazing, but it’s not easy,” said Lee of raising her daughter. “I have a really great family, both mine and Donny’s. She’ll hang out at the gym while we train in the morning. Then they’ll pick her up after work and take care of her. With both parents thriving in combat sports, it wouldn’t be surprising if Ainslee followed in their footsteps. But according to Lee, it may not be that straightforward. “If she sees other kids getting into it, she’ll be more apt to do it. Anything he wants her to do, she’s going to rebel,” Lee joked. While her daughter’s future may still be up in the air, Lee’s is more clear. 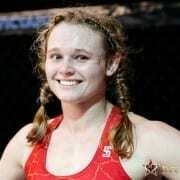 After a lightning-fast TKO win in her professional debut that saw her kick off her opponent’s finger, Lee was signed by Invicta Fighting Championships. “KGB” impressed in her promotional debut, edging out Shannon Sinn. Just a month later, Lee was called upon for a big step up in competition against Roxanne Modafferi at Invicta FC 10. 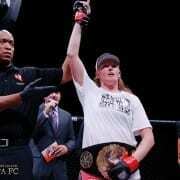 Lee fell short on the scorecards in Houston against Modafferi, but the Louisiana-based fighter proved she’s much more than a striker by pushing the veteran for a full three rounds. With so many accolades in the striking arts, Lee’s performance against Modafferi showcased glimpses of a different side of her fight game: her self-proclaimed “underrated” ground game. But, unfortunately for Lee, there was something amiss in the cage that night that kept her from proving just how skilled she really is. “You know, I’m not making excuses, but I don’t feel like I was completely there that night,” she declared. “The performance against Roxanne, I didn’t really get to display anything against her. Lee will have an opportunity to prove it on Sept. 12 in Kansas City, Mo., when she takes on Hawaii’s Rachael Ostovich at Invicta FC 14. The two fighters have fought on the same card in the past, but Lee has no problem setting aside their existing relationship to get back in the win column. A win against Ostovich would help Lee rebuild the momentum she needs to be considered for 125-pound title contention, as well as for her long-term goal of being the best in the sport. Being the greatest of all time may still be years away, but it’s clear that Lee has a plan to get there. Now her job is to go out and execute in the Invicta cage. Andrea would like to thank: her sponsors: Carbonation Toy, Classic Sound, Martial Arts Life and Amber Sports. Also her head coach, Donny Aaron, all of her coaches and training partners from Karate Mafia and Elite Combat Academy, and the girls that came in for this camp: Sharon Jacobson, Amanda Bobby Cooper and Jinh Yu Frey.